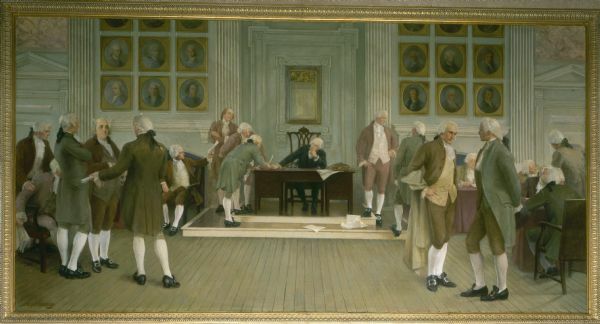 Before the ink had dried on the U.S. Constitution, representatives of the thirteen colonies tried to figure out how new states might be added to the union. The result was the Ordinance of 1787 — or the Northwest Ordinance — adopted on July 13, 1787, by the Second Continental Congress. The Northwest Ordinance had four important stipulations. First, it authorized a provisional government for the territory northwest of the Ohio River that the United States had obtained at the end of the Revolutionary War. Second, it provided a method for making new governments out of that territory. Third, it guaranteed a bill of rights to inhabitants of the new territories and prohibited slavery in them. Finally, it outlined a way to survey and denote the new lands so they could be sold to settlers. The most powerful effect of the Ordinance of 1787 came from the last provision, concerning the survey of public lands. Although it closely followed a system proposed by Thomas Jefferson, this last prerequisite was probably drafted by Nathan Dane — for whom Dane County was named — and Rufus King. The survey called for teams to hike across the land, measuring it into six by six mile squares called townships. They then divided each township into 36 squares of 640 acres each. The surveyors' notes were used to draw township maps, which were kept in local land offices to help sell the land to new owners. 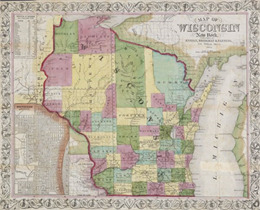 The survey of Wisconsin began in 1832 at an initial point on the Wisconsin-Illinois border ten miles east of the Mississippi. It concluded in 1866 in the north woods. The first land offices opened in 1834 in Mineral Point and Green Bay. As settlement increased in these regions, land offices closed and new ones opened in more remote parts of the state.